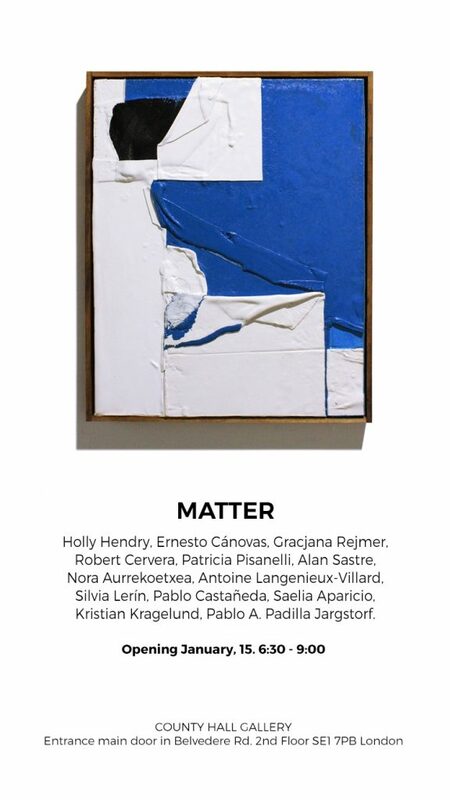 WeCollect, SpainNow and SCAN are pleased to announce the opening of Matter, a group show with works by 13 international artists living and working in London: Holly Hendry, Ernesto Cánovas, Gracjana Rejmer, Robert Cervera, Patricia Pisanelli, Alan Sastre, Nora Aurrekoetxea, Antoine Langenieux-Villard, Silvia Lerín, Pablo Castañeda, Saelia Aparicio, Kristian Kragelund, Pablo A. Padilla Jargstorf. The exhibition opens on Tuesday 15th of January at the County Gallery, County Hall, London. Matter is the word for physical substance; it occupies space and possesses mass. At the same time matter is a subject for consideration, what happened, an incident, an episode; it is only a matter of time. But then again matter is also active, a state of significance, possibly fleeting; some things matter; it matters to me. All three matter meanings are linked by a thread of weight or a measure of significance. If material matters, if it is worthy of consideration, it may be as register of the development of an idea, or line of work. Reasoning is the act of thinking about something in a logical manner; material reasoning might be a manner or practice of thinking through material investigation, repetition, play or studio procedures. The artists participating in Matter pursue varied practices but share an interest in investigation of material and work matter with and against meaning. Material and apparent meaning sometimes align, but not always; matters are not what they seem. Like Peter Pan’s shadow, meaning can slip off, come unstuck. Peter’s shadow comes off when he flies out a closing window. What kind of synthesis occurs when meaning breaks loose? Matter holds meaning, and lets it go. The thought moves on. The material remains, on the floor, the table, the wall. Maybe a new process begins. New Materialisms places matter at the centre of art practice and emphasises production over discourse and preferences the value of physicality and materiality over conceptual models based on language or syntax. Matter is what we see, and what we use to make. The works in Matter explore the possibilities of making and of material and play thoughtfully with what matters. Copyright © 2018SpainNOW!. All Rights Reserved.